A World at War Betrays the Nation of Poland. observed from both sides of enemy lines. 1944-45 without restrictions after the liberation of Rome. pulls out a few issues of "The Stars and Stripes"
that had been circulating in Allied camps. coverage from the period that's being discussed. like articles from Mussolini's R.S.I. dated in 1944.
each other's company and sharing their intellectual abilities. to reach mutually agreed conclusions to build upon. needs and their voids about Europe's current state of affairs. The Western front – the Axis – and the Eastern front. the void they equally hungered to fill – was not filled. hungry for news about Lwów. They were starved for it. ... as it was tightly held in Joseph Stalin's grip of steel. the Soviet Union's successful counter-offensives in 1943.
only after the debut of the Polish 2nd Corps in the west. the Wehrmacht a haunting that would inhibit them. new upright adversary against Germany. concern, than did the blood thirsty savagery from the east. given Germany its fatal blow! on Monte Cassino ... but it did not end in Bologna! permeated the entire western front. who conspired to invade Poland is also defeated. Then and only then, the war will have ended. world's task at hand was only half done! on 29 April 1945. And then, they sit to eat breakfast. in the soft underbelly of the Third Reich. celebrations with other units of the Polish 2nd Corps. seen since 1939, and neither did we. André and Franki patiently anticipate the repatriation. of Poland with the brave 2nd Corps. in Lwów for their sacrificed heroes. there also for the solemn occasion. 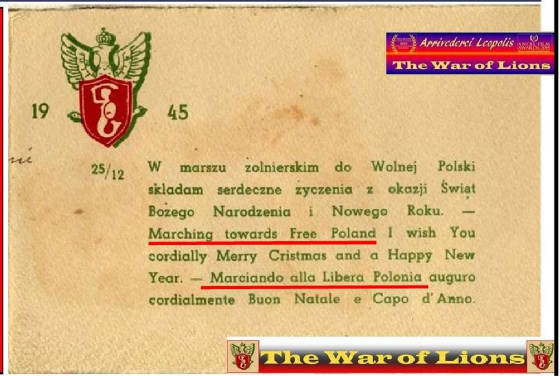 are issued to any of the Polish soldiers in Italy. their units to participate in London's Victory Parade. home directly from London soon after the Victory Parade. Perhaps, they hope, the next day, right after the parade. In this way, they reconcile themselves. Their LAST Christmas away from home! ... entry to Poland would not be permitted. Polish friends, realizing that they had sufficient frustrations of their own. ... or elect a new republic with similar rule. is also scheduled to take place in June. thousands other members of the Polish 2nd Corps. to Poland, must postpone their hope to June 1946.
that will soon become a distressing reality ... to all of us. Victory's good cheer with André, Franki, and other Polish friends. and eastern Poland with the intention to never let it go. that the Soviets had renamed Lwów ... as "Lviv" in Ukrainian. its contents would become nationalized Communist property. 1946 was NOT going to be a happy new year. ... But they don't know it. troops and some of it was being confirmed in the newspapers. campaign of victories during 1944 and 1945. ... but their hope had begun to fade! Parade in which all other Allied nations would be marching! beloved nation had been betrayed also! during the war ... had become ill-fated in 1946.
might be able to go home ... in one way, or another. Their dim hope, however, was becoming short-lived also! their victorious return to their cherished "Free Poland." had died ... had been betrayed by the world's leaders. over to its original enemy, the Bolshevik Soviet Union. conspiracy with Adolf Hitler and Nazi Germany in 1939! superscripts, short newsreels and vintage headlines. the valiant action of Lwów's Polish Cavalry in 1920. But in 1945 Poland had been betrayed by those she had protected. treachery from being repeated again. starting the war in in the first place. The villain was Joseph Stalin. to eradicate it totally from the map of nations in Europe. the leaders of the free world fulfilled Stalin's original ploy, in 1945.
noble warriors into a global crowd of homeless exiles. Afterwards, he created his own dim version of a Bolshevik Poland. by Poland's armed forces – and gave themselves Victory Parades. considered to be ENEMIES of the BOLSHEVIK POLISH STATE. It was Stalin's method to crush any resurgence of Polish nationalism. family bond had been ripped apart by godless Bolsheviks! cultural, and religious foundations of Polish families. really means to them – and to their loved ones back home. families' lives too, would be affected, as well. to oppress Polish identity and nationalism. meant certain persecution, imprisonment, or even death. or had to choose, not to go home to their families! military and civilian deaths in Europe. it was also a crime against Poland's surviving families! ... It broke-up the families of noble Polish fighters. The heroes who defeated Nazi-Fascism in Europe. compromise. It was spiritual defiance against God! "What God had yoked together, let no man put apart." by Allied nations – against the rulings of Heaven! western nations, most of who profess to be Christian! members of Poland's armed forces dispersed in Europe. They all had families, and at least half of them had wives. ones to unrelenting Soviet persecution. a very difficult choice ... so they never returned home! and possibly also making widows of their wives! sacrifices ... they could never go home! ... and remained broken for at least three generations. had been transformed in the aftermath. to their enemy, to endure a historical 50-year captivity. by a devious compromise by the world's leaders. had been dealt a treacherous political defeat. True Historical Cases with added Scenes and Dialog.